Here in Richmond, I am surrounded by beautiful architecture. I live in an area of town that is home to the largest collection of Victorian houses in the U.S. . Monument Avenue, the large boulevard that is the only street designated as a National Historical Landmark, is right outside of my back door. And while the museum is undergoing its expansion, my area of town, the Fan, has allowed me to vicariously live an elegant existence. 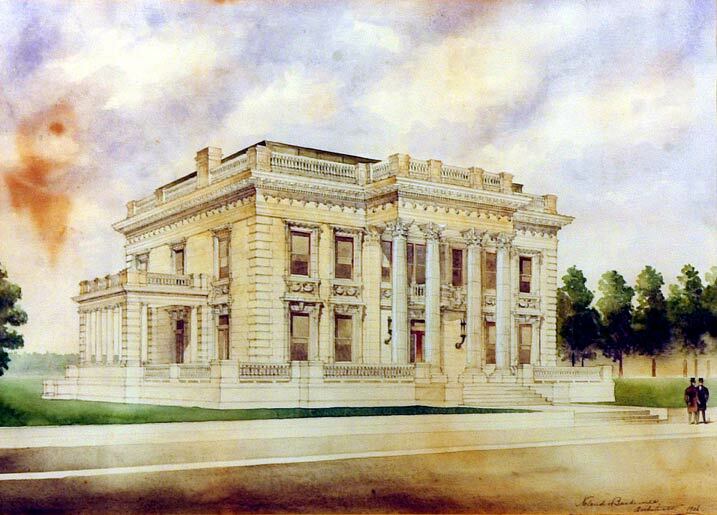 A case in point: the Frederic and Elisabeth Scott House at VCU, seen in the watercolour above. The house is a result of our own “American Renaissance” during which our merchant princes (or “robber barons”), architects, sculptors, painters, critics and artists of all stripes saw many parallels with their counterparts in fifteenth century Italy. By looking to a golden age of the past, we hoped to create a national American art; to see that the splendors of the American way of life were writ large in the pages of history. Our existence was inevitable — the logical extension of an age that believed in science, hard work, beauty, civilisation… progress. It was an intensely nationalistic time that lasted from 1897 through 1917 and our involvement in the War to End All Wars. An atmosphere of leisurely elegance was the order of the day. 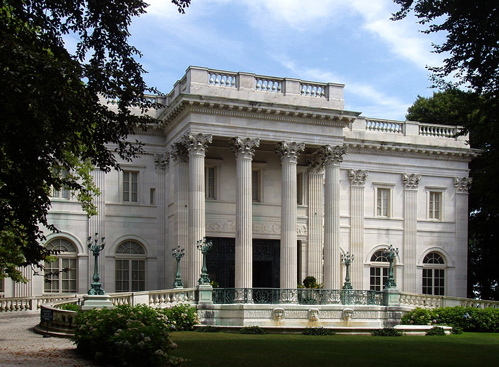 The firm of Nolan & Baskervill (no, not a typo, they’re still around and still there is no “e”), the architects of the Scott House, were given as their model Mr. and Mrs. Vanderbilt’s “The Marble House” in Newport, R.I.. 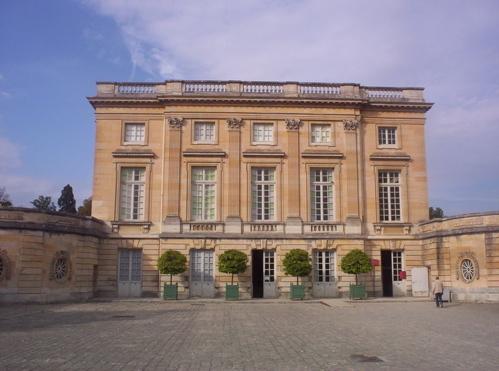 The Marble House, in turn, is rumoured to have been inspired by le Petit Trianon at Versailles. The house was completed in 1911. Mr. and Mrs. Scott took up residence in 1911. A daughter and her family lived in the house until her death in 1985. Students at VCU could rent rooms on the third floor through the 1990’s. Today it is a Virginia Historic Landmark. The completely renovated first floor is open to the public while the University’s “Office of University Advancement” occupies the second and third floors. Learn more about The Scott House in an online timeline, here. Or take the virtual tour. Mrs. E. and I will be touring the house next week. And I understand that it is available for events… Gatsby for a day. This entry was posted in Elegantology and tagged architecture, Elegantology, Richmond VA. Bookmark the permalink. Thank you for your work in creating this wonderful blog. Thank you and welcome Mr. Stuart. And thanks for filling in some of the gaps. Mrs.E. and I also had a behind the scenes tour of The Branch House today which really was fun and must have been something in its heyday. I used to live in Church Hill and so benefited from her preservation efforts. Mrs. E. and I have also been guests at the 2300 Club and enjoyed that, too. She must have been a lot of fun to know! Speaking of which, you sound as if you know Richmond. Please feel free to pipe up anytime with interesting tidbits. I worked for a place where one of the Carter/Scott family was on the board. She had a big retreat for everyone on the staff up at the Castle. Incredible place and so nice to know places like that exist in the US! Loved your commentary on kiddies… I’m in total agreement! I love how you contrasted the three buildings here. Fascinating era. Hope you and Mrs. E enjoy the tour and give us a report.